We launched the Fraseropolis Urban Villages project in March 2012, six months after opening this site. Our amateur definition of “urban village” focuses on places where residents can find everyday services, transit and housing choice within easy walking distance. Not everyone wants to live in a village; but a successful village attracts enough people that business and community life flourish. 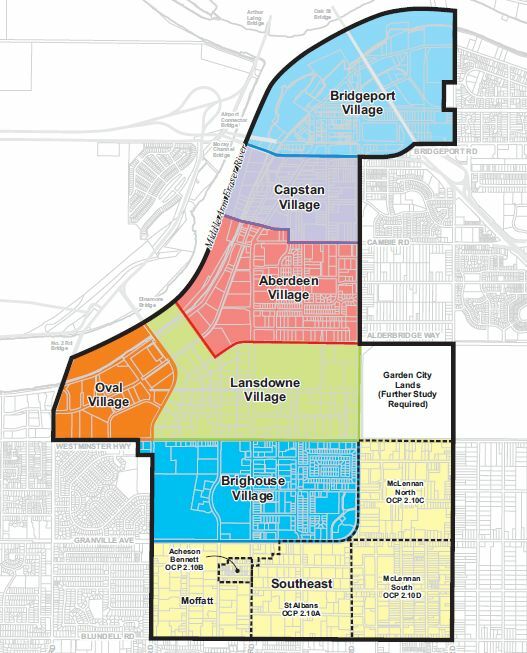 The City of Richmond, British Columbia, in its 2009 whopper of a City Centre Area Plan, looks at the urban village in an expanded way. The Plan describes villages as a key part of the City’s City Centre development strategy, and identifies six of them. (“Candidate villages” might be a better name, since most of them exist only on the drawing board.) 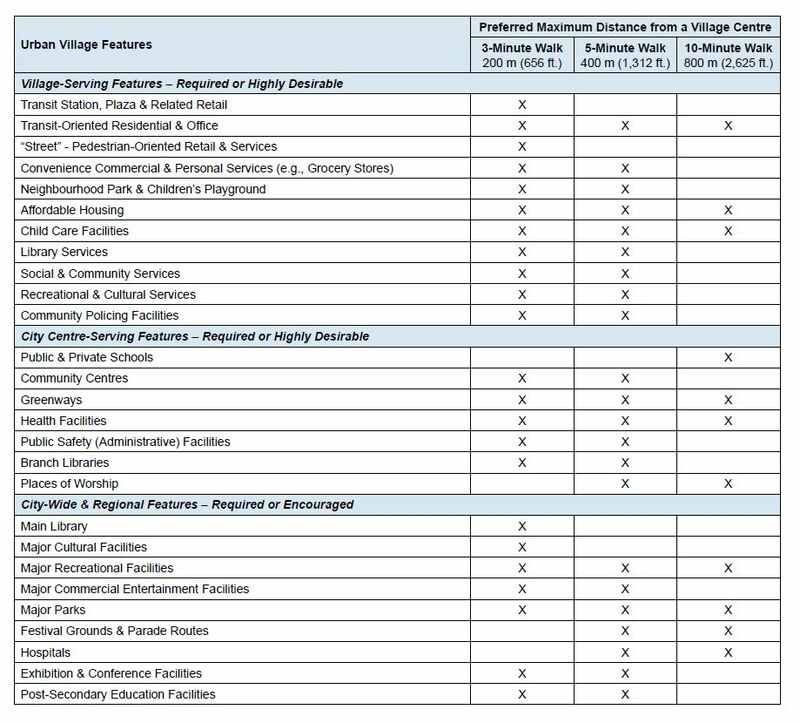 The Plan says that “‘Urban village’ is another name for the type of compact, walkable, transit-centred community encouraged by Transit-Oriented Development.” Page 1-10 lays out a grid of required or encouraged village features. The grid looks at first like a more rigid form of the Fraseropolis UV Index. The first tier lists required “Village-Serving Features” — for example, a library within a five-minute walk from the village centre. There should also be commercial and personal services, affordable housing, child care and recreation within the same radius. So far, so good. The second tier takes in “City-Centre Serving Features”, drawing in folks from nearby core neighbourhoods but clearly contributing to life in the village. These features include recreational paths, schools, community centres and places of worship. And so to the third and more questionable tier. 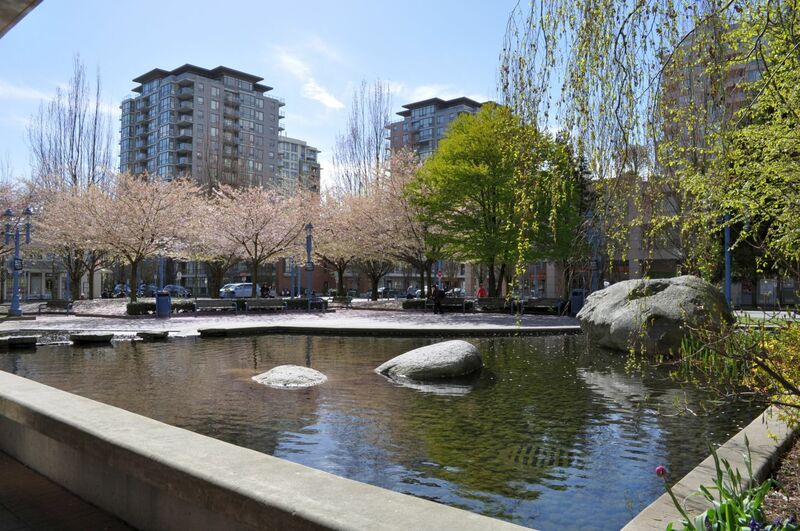 The City of Richmond, adjacent to the City of Vancouver and home to Vancouver’s international airport, is projecting that its downtown population will have doubled between 2006 and 2021. It intends to promote rapid growth of the City Centre’s commercial base, and its industrial base, through the same period and beyond. Urban villages are to arise alongside regional-scale employment and cultural facilities; and in a brave attempt to sort out potential conflicts, the Area Plan expands the normal list of components in the urban village, listing nine large-scale land uses as “Required or Encouraged” for village life. Does a succesful urban village require “Festival Grounds or Parade Routes?” In Cloverdale village, in the City of Surrey, the summer fairgrounds creates a dead zone for 11 months of the year. A major park? A college campus? A hospital? A convention centre? A regional-scale casino? Any of these might co-exist with village life, if they were placed carefully at the margin; but the ability of the village to absorb bigness is limited. The Richmond planners are trying to do everything at once, and this includes preserving the single-family character of the streets just outside the City Centre perimeter. Commercial, industrial, cultural, transit and residential uses are to be squeezed into a relatively confined area. Brighouse, the most populous of Richmond’s core villages, is already home to a large hospital, an elevated transit line, and a mammoth mall. Has the term “village” been stretched beyond its limit? We’ll return to Richmond Brighouse in the next post .